It can be difficult to keep kids active indoors during the wet and chilly winter months, but CedarWorks offers an awesome solution in their new collection of Rhapsody playsets and playhouses. Especially made for indoor active play, CedarWorks' Rhapsody line features amazingly designed structures that will entice your child into staying mobile while encouraging imaginative play. 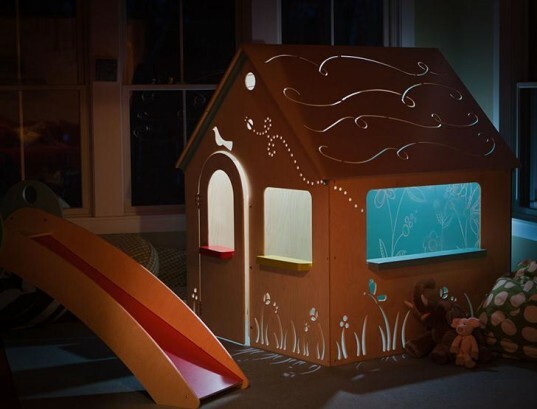 A Rhapsody playhouse or playset is the perfect addition for a dedicated playroom, a corner of a bedroom or even a den or living room due to a modern fresh design that's not just fun but will fit in with your home decor scheme. Each Rhapsody playset and playhome is designed with high quality materials, and they are made to a scale that fits inside a home, as opposed to outside. These are fully custom-ready sets that come in various sizes, colors, configurations and prices to suit any family. Playsets are available in smaller or larger sizes to fit your home and depending on what your child would like, you can add ramps, a climbing wall, a firepole, doors, monkey bars, a bridge and so much more. Keep reading to learn more about all the cool benefits of the CedarWorks Rhapsody collection. The playhouses in the Rhapsody line are simply divine. Some models come complete with amazing details such as a full wall chalkboard for doodling, an inviting breezeway, sneaky entrance and exit circles, delightful cut-outs and a roof held together with holes. The Classic Playhouse is also a dream come true, featuring a spacious gable roof design, three wide-shelved windows, full wall chalkboard, cottage door, flowers, birds and bugs. The entire Rhapsody collection is made with furniture grade solid hardwoods and premium multi-ply Baltic Birch laminated panels. The colored components of Rhapsody playhouses and playsets are finished with low-VOC stains while the naturally colored pieces are finished only with water-based stains for even lower VOC emissions. CedarWorks’ offers modular design, friendly Design Experts and award-winning design programs, so your playset or playhouse will perfectly fit your kids, your home, and your lifestyle. Rhapsody keeps kids active and moving, even when stuck indoors. No cabin fever here. You can design an indoor playset online on your own or via phone with a Design Expert. CedarWorks’ ReCedaring program has donated more than 450,000 seedlings to small woodlot owners and environmental organizations. CedarWorks donates 10% of profits to organizations and programs that benefit kids and the environment. CedarWorks indoor playset components are made locally in Maine and the people making them receive living wages, good benefits, and safe workplaces. Rhapsody playsets can be used by kids as early as 12 months of age with no upper age limit. In fact, Rhapsody playsets are designed to hold adult weights and the company was actually unable to break the product during weight testing. The average Rhapsody playset is fairly easy to assemble for two adults using common household tools. The Rhapsody play system is modular so you can add or change things around as your family grows and changes over time. CedarWorks’ warranty system is comprehensive for a period of 2 years from the date of purchase. The playhouses in the Rhapsody line are simply divine. Some models come complete with amazing details such as a full wall chalkboard for doodling, an inviting breezeway, sneaky entrance and exit circles, delightful cut-outs and a roof held together with holes. The colored components of Rhapsody playhouses and playsets are finished with low-VOC stains while the naturally colored pieces are finished only with water-based stains for even lower VOC emissions. Going on pure design alone, how could you not adore the Rhapsody line? Still, if you're looking for even more reasons to fall in love, check out the benefits in the following slides. CedarWorks' offers modular design, friendly Design Experts and award-winning design programs, so your playset or playhouse will perfectly fit your kids, your home, and your lifestyle. You can design an indoor playset online on your own or via phone with a Design Expert. Additionally, CedarWorks' ReCedaring program has donated more than 450,000 seedlings to small woodlot owners and environmental organizations. Cedarworks playsets are entirely plastic-free. CedarWorks' warranty system is comprehensive for a period of 2 years from the date of purchase.